Tina Arth reviews a Christmas production she calls a 'total crowd pleaser,' and performances running until Dec. 23. The Little Sisters of Hoboken have taken their show on the road, so they must really like each other — how else to explain three of them reprising a show I saw six years ago at a different theater? The current production at Theatre in the Grove has a different director, several new cast members, a petite orchestra, and the irrepressible Parker Pup collecting toys in the lobby — but despite a few ragged moments, the heart of the show still beats strong, and the silly, irreverent humor is definitely intact. Director Ken Centers (with the help of the Reverend Mother's piercing glare and Sister Mary Hubert's threatening yardstick) has transformed the most dysfunctional troop (and troupe) of nuns in history into a total crowd-pleaser, and local audiences are reveling in the fun. 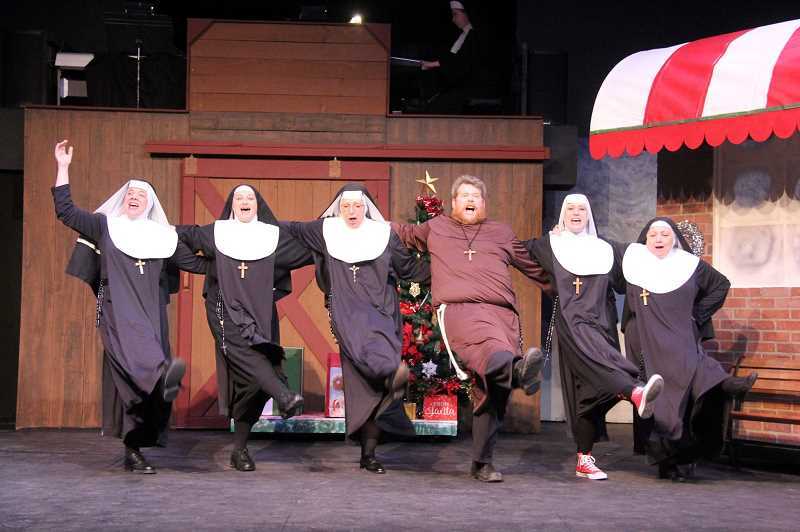 "Nuncrackers" is the Christmas-themed third in a series of sequels to playwright Dan Goggin's original musical nun-fest, "Nunsense," and like the others, it is filled with Catholic humor and a mixture of comic and more touching songs. In this version, the Little Sisters are preparing to do a live Christmas broadcast from their new television studio in the convent basement (paid for with Sister Mary Paul's Publisher's Clearing House winnings). Of course nothing goes right — Sister Mary Leo is on the injured list right before her big ballet number, Father Virgil has to step in to cover for the absent Sister Julia Child of God on her cooking show, Sister Mary Robert Anne is relentlessly scheming on how to score a big solo number, and Sister Mary Paul (aka Amnesia) delivers nonstop malapropisms that sometimes leave little to the imagination. Of course, this is holiday-themed musical comedy, so the show must (and does) go on, with lots of help from an active audience participation program. Oh — and the mystery of the stolen Christmas gifts is resolved with the expected heartwarming solution! The sisters have brought in three school kids from Mount Saint Helen's Convent School, and the trio (Abrianna Feinauer, Rachel Newton and Ian Romig) brings a lot of comic and vocal talent to the show. Romig is a hoot to watch, as he goes along with the ridiculous demands placed upon him — his body says "I'm being a good sport," but his face tells a different story. Another high point, setting the tone for the whole show, is the entire opening sequence (instead of music or a conventional curtain speech, we get nuns telling slightly off-color jokes and some truly bizarre Christmas gifts for a few lucky audience members). Wendy Bax (Sister Mary Paul) follows up her Secret Santa gig with a rendition of "Santa Ain't Comin' To Our House" straight from the back alleys of Dollywood, and the tutu-clad Jeanine Stassens (Reverend Mother) and Brandon Weaver (Father Virgil) attack "The Nutcracker" with surprising vigor. What they lack in grace, they make up for in enthusiasm. One of the best scenes is Weaver's cooking show — in a world where fruitcake humor can be mind-numbingly tired, Weaver uses little more than physical comedy and fake fruit to leave the audience in stitches. The audience is rooting from the start for Jennifer Yamashiro (Brooklyn-born Sister Mary Robert Anne), but when she finally gets her big chance in "All I Want for Christmas," it's doubly poignant, as she's joined on stage by son Noah doing a couple of fine trumpet solos. Pruella Centers (Sister Mary Hubert) is as much fun to watch as to listen to with the over-the-top vocal riffs in her big number, "It's Better to Give." Based on the nearly sold-out house, it looks like Theatre in the Grove is once again demonstrating the company's knack for offering just what their audiences want. Many of the best seats are gone for upcoming performances, so buy now!